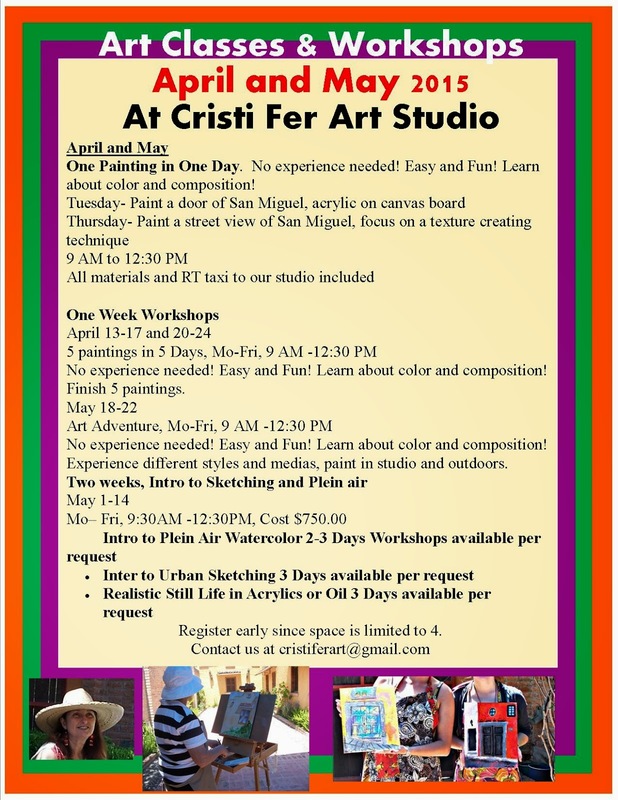 This is our updated April and May 2015 Art classes schedule. Feel free to print it and share it with your friends. As experienced painters and teachers we are able to satisfy a wide range of painting skills, from the beginner to advance, and artistic interests. This time of the year it's a pleasure to paint outdoors and our large patio garden offers many topics of inspiration and ambiance: chirping birds fill the trees and fountain, roses in bloom, the tranquil fountain with fish, the little casita with plants, and bell, give us many topics ready to offer inspiration. Contact us asap with your travel plans and lets schedule your next art adventure in San Miguel de Allende. Special invitation to teachers Summer vacation and retirees escaping the hit of the Southwest.